A key reason why the economy will not improve under an Obama administration. This is way to easy to explain. The only people that will have a hard time grasping this are Obama supporters. They're is no way a country can "conserve it's way out of a recession". To do that would be like trying to clap with one hand. As a nation's economy starts to grow, it will naturally start to consume more energy to met the demand of it's growth. As airlines add more flights to it's schedule due to higher demand, the additional planes will consume more jet fuel. As stores order more goods to meet the demand of customers, more goods will have to be shipped to those stores. That means more trucks will have to be used, and that also means more diesel fuel used to fuel those trucks. Follow me on this. OPEC just cut oil production twice this month by 2.5 million barrels. Because demand is so weak due to the economy, the prices are continuing to fall regardless of the cuts. If the economy was to turn around under Obama, the price of oil would sky rocket back up to $150 a barrel even faster then before due to the supply being cut. It was the price of gas earlier this year that caused people to slow down their spending, and that caused the beginning of the economic downturn. The housing market mess just accelerated it. This is the kicker. If the economy starts to rebound and gas prices shot back up to record territory, this is what "President Obama" is going to have to tell the American people. Like I said, An Obama presidency is just the 2nd term of Carter, and history does repeat itself. Where does Barack Obama stand on the issue of driver licenses for illegal alliens? This video is from the Democratic Primary Debate last November. It's absolutely astonishing that the issue of illegal immigration hasn't come up in all the debates or in the political ads until now. I watched the clip, and I still don't know if Barack approves giving illegal aliens driver licenses. The poor soul had the deer caught in the headlights look when asked the question. If I had to guess, I would say he does support giving illegal aliens driver licenses. I mean isn't that what any good Socialist would do? A radio interview with Barack Obama in 2001 on redistrubtion of wealth for African Americans. Barack Obama is a flaming socialist. If anybody thinks that a free market economy is going to get better under a hard left socialist, you are going to be in for the rudest awakening imaginable. Palin for President in 2012 win or lose? Win or lose next Tuesday, the political path has been laid for Governor Sarah Palin for a 2012 run. The media has done it's best to destroy not only the reputation of Sarah Palin but also any thoughts of her as a viable candidate for Vice President or even President. The only people that believe the image of Palin that the media have tried to paint are Obama supporters and the media itself. Even after all their attacks from the very first minute McCain announced her as his VP pick, her popularity has continued to grow and grow. Palin's appearance on Saturday Night Live two weeks ago was it's highest rated show in 14 years. Palin's Vice Presidential Debate with Joe Biden was the second most watched debate ever with only the debate between Jimmy Carter and Ronald Reagan as number one. Also, her speech at the Republican National Convention was the second most watched convention speech ever with 37.2 million viewers. Her speech as a Vice Presidential candidate nearly surpassed Barack Obama's speech at the DNC by only a million more viewers. I have five reasons why Sarah Palin will be on the political radar leading into the Republican primaries in 2012. Governor Palin's popularity is massive regardless of what the media tries to say. She is right now to the Republican Party what Barack Obama was four years ago to the Democrat Party. She's a "rising star". It was the selection of Sarah Palin that excited and solidified the conservative base around McCain in the first place. Palin's popularity is responsible for millions of women copying Palin's hairstyle and buying the same type of glasses she wears. Governor Palin's popularity transcends beyond fashion. Polls taken have shown that Sarah Pallin has a higher likability factor then Joe Biden, also most Americans believe that the negative coverage of Palin by the media is due to an anti Palin bias by the national media. Several websites have popped up to generate grass root support for Palin to run in 2012. She is able to connect with mainstream voters, and she has the ability to come across as a normal everyday person. Many candidates on the local, state and national levels don't have that ability or presence. If Palin decides to run for President in 2012, she won't have to worry about standing out from the crowd. She will instantly benefit from her national name recognition. Raising money for a primary campaign run shouldn't be a problem at all. If Barack Obama governors like I think he will if he wins. I have no doubt at all that he will be a "one and out" President just like Jimmy Carter. The massive sell offs in the stock market recently are investors predicting that Obama will win the election. The stock market is intertwined with the economy. As the stock market falls, people suffer from a decline in the "wealth effect". People tend to spend less when they are feeling poorer. That translates into companies not hitting earning projections set by analyst, and that then impacts the prices of the stocks causing them to decline further. It becomes a vicious economic cycle. Obama won't fix the economy. He's a hard left Socialist, and Socialist policies do not promote economic growth in a free market economy. Obama is going to have run on his record if he wins four years down the road. He won't have the luxury of passing the buck against Republicans when the economy is in the tubes, because Republicans really won't be able to stop Democrats as a minority party. Any candidate that runs against Obama in four years clearly will be in a much stronger position then right now. Palin will have the ability to rally a lot of ticked off people that voted for Obama thinking he was actually going to fix the economy but made matters even worse. The media has dug up all the so called dirt possible on Sarah Palin. They have now been reduced to attackin her on her "wardrobe". The media didn't say one word about Barack Obama's connection with Tony Rezko and the land deal that allowed Obama to build his million dollar house, but to the media they are focusing on the October surprise of "dress gate". Anyways, the media has already exhausted the story of Palin's pregnant daughter and "trooper gate" was a non starter. It will look extremely petty for the media to rehash the same old news against Palin in 2012. The political landscape four years from now will be entirely different. Palin got a taste of how the media operates, and she will be better prepared to deal with them four years out. 4. Sarah Palin would be the first female to win the nomination for President of a Political Party. In the Republican Primary, her being a conservative female will serve as an asset. I hate to bring up race and gender, but the facts are still the facts. Republican women make up a huge portion of the Republican electorate, and they are major backers of Palin right now. I really don't see that changing after November 4th win or lose. Don't mistake her easy going motherly personality for that of cream puff. Some Republicans in the McCain campaign are already saying that Palin has gone "rogue". In other words, she is doing things on the campaign more so to benefit her in a possible run in 2012 then to help McCain win right now. I guess the old saying is true "leave a lasting impression". It's hard to say if McCain will blame Palin if they come up short next Tuesday. If the McCain camp does blame Palin, it's only going to boomerang right back at them. Sarah Palin has right now going into next week something John McCain has never had. She has to backing of the conservative movement and most Republicans and she knows it. Right now as it stands, I am torn. I really like Sarah Palin, and I would have loved to see a second debate between her and Joe Biden. She does have a "rockstar" presence about her, and she has great potential four years from now. I'm also a fan of Bobby Jindal. He has also been refereed to as the rising star of the Republican Party. Some conservatives have called him "the second coming of Ronald Regan". One thing is for certain, the mistake of running a sheep in conservative clothing won't be repeated in 2012 as with McCain if he loses. As for Governor Palin, the media better fear her, because they can't and won't be able to destroy her. Palin is going to stick around for awhile win or lose Tuesday. This is how Biden reacts when the media isn't licking his knee caps. Poor Joe was probably wondering what in the hell just happened when the interview was over.. I guess Joe is only capable of answering fluff questions. This is how hard hitting journalism should be. If only the national media could understand the concept of hard hitting balanced journalism. For the record, Biden lied about the campaign not paying ACORN to register voters. Obama paid Acorn $800,000 to "get out the vote". Nice try Joe, now say it isn't so. Joe Biden suffered another emotional short circuit during another hard hitting interview in Philadelphia. Say it isn't so angry Joe. How funny is it that people called the station crying that Biden was actually asked hard questions and comparing the the CBS station to "FOX NEWS!! Would they have called the station to complain if the anchors were drilling Sarah Palin in an interview? You all know the answer to that. Some of the callers called the interveiw "ambush journalism". Of course they didn't say a word about the Sarah Palin "ambush" interviews with Kouric and GIbson. Will two faced hypocrites ever have any shame? Words from the man who refers to Barack Obama as the "messiah"
Recently Louis Farrakhan refereed to Barack Obama as the "messiah". Obama helped to organize one of the Million Man March's. The reason why it's more then fair game to bring up Obama's associations is because most of his associates are extremely hate filled and flat out radicals. This footage is from the "In the name of Allah Saviours Day" event this year. I'm curious about something, and I can't seem to figure out the answer. Louis Farrakhkan is the minister or leader of the Nation of Islam. Mohammad is considered to be the prophet of the Islam god Allah. Louis Farrakhan once called Christianity a "gutter religion". Here's the question I just can't seem to answer. Why would Louis Farrakhan call a so called Christian in Barack Obama the "Messiah"? I want you all to watch this video very carefully and think long and hard on this. As I said before people are judged by the company they keep for a reason. It's now considered "racist" for 12 year old girls to wear Sarah Palin T-Shirts. I'm so sick and tired of hearing the words race, racists, or race codes by the media and Obama supporters. I feel like I want to throw up every time I read a news article, listen to the radio or turn on the television. Obama and his surrogates in the media have played the race card so many times, the darn card is worn out and is being held together with duck tape. Race has not only been used as a political strategy by Obama and the media, unfortunately it's is woven into the mindset of people voting both black a white. Everybody that knows me know that I can't stand double standards. All I hear everyday is that blacks should vote for Obama out of pride, and whites need to as well if not they must be racists. Where is the logic in this asinine thinking? It has gotten so bad in this country right now, even young children are now involved in the whole race issue. A 12 year old girl by the name of Ashley Jones wore a Sarah Palin t shirt to class recently, and her class mates called her a "racist" for doing so. The reason why her class mates called her a racist is because Ashley is white, and in the young minds of mush they figure that she can only be supporting McCain and Palin because she is white and McCain and Palin is white. I said when Obama won the nomination his supporters and the media were going to make everything about race. Once again, I'm proven right. White adult Obama supporters carry the same mindset towards white adult McCain supporters. In their narrow minds they believe that the only reason whites won't vote for Obama has to do with race. It's funny, because whites that support Obama truly don't see their own flawed racial perspective. They can attack other whites for not voting for Obama, yet they can't seem to come up with valid reasons for why whites or anyone for that matter should pull the lever for Barack Obama. Little do they know all that they are doing by their actions is belittling the validity of Barack Obama as a serious and worthy candidate to become President of the United States. They have in actuality made Barack Obama more of racial preference candidate then a legitimately qualified candidate. Of course they won't see it like that, it takes to much thought on their part. They are too blinded by their ignorance. The media surely wont' admit it either. They rather try and go after Rush Limbaugh for stating the obvious. The media keeps referring to Obama's campaign as "historic". Well what pray tell is the historic aspect of Barack Obama's campaign? I don't even need to play the Jeopardy music for this one. The media is obsessed with Obama's race as the "historic" element to this campaign. White guilt is definitely at play with their support of Obama. Not all of Obama's white supporters are self inflicted guilt stricken but there are a lot. If a black conservative was running right now, white and black liberals would be saying not to vote for that candidate because he or she isn't really black. Go figure. Collin Powell becomes the media darling if only for 15 days. Colin Powell today endorsed Barack Obama for President, and the media is drooling in delight because of it. They are broadcasting his endorsement as major, stunning, etc. My question is why is his endorsement considered important? As I see it, he's endorsement isn't going to have any sway with most blacks, they already were going to vote for Obama anyways. Besides blacks still consider him a Republican "sellout" from back in the days when he was the first black Chairman of the Joint Chefs of Staffs as well as the first black Secretary of State. I have to admit, I do consider Collin Powell to be a huge sellout as well. It's not on the issue of race for backing Obama, but it has to do with him selling out the military by backing Obama. Powell has been a military guy most of his life. Collin Powell either has no idea what Obama has planned for drastically downsizing our Armed Forces or he doesn't care. It's one or the other. I'm sure Powell is familiar by now with who William Ayers is. This is another issue with Powell in which I scratch my head in confusion. Barack Obama launched his political career in the house of a man that is proud he set off bombs at the nerve center of the United States military being the Pentagon and wish he had done more. Why would any military person endorse a person that has affiliations with people like Ayers? Right now they're are tens of millions of people suffering from the "dumb dumb disease" with this romantic trance over Barack Obama. Powell said that Barack is the best person to deal with the economy. My question is what qualifies Obama as the best person to deal with economy. I'm not even saying McCain is but this is all I hear, yet nobody can tell me what are Obama's economic qualifications that makes him any better then McCain on this issue. I wonder will Powell finally make the transition complete and re register as a Democrat. As much as I can't stand liberals, I hate RINO's almost as much. Since Powell is now in the good graces of the media, for the next 17 days he will be promoted as the most important person in America next to Obama himself. The puzzle is complete. Meet the Democrats responsible for the genesis of the global financial crisis of 2008. The McCain camp should be playing this ad in non stop rotation for the next 17 days. The other day I watched in absolute anger Democrats in congress looking down and drilling the CEO'S of AIG and Lehman Brothers. I've notice and others should notice as well that the Democrats haven't called the executives of Fannie Mae and Freddie Mac to congress to testify, and they won't either until AFTER THE ELECTION. Mostly everybody in the financial community has already figured out how this whole mess got started. Even SNL did a skit about it, and NBC took it down just as fast. Obama is benefiting from the acts people in his party created. The only reason this is happening is because the media in this country is too concerned about destroying a plumber from Ohio, and a teenager girl from Alaska then doing their job. I really don't know how Nancy Pelosi can sleep at night lying through her teeth by blaming Bush for all of this. That woman is a piece of garbage along with the others that created this and tried to block people from fixing it before it was too late. They say they are looking out for the little guy? Thanks to them the little guy has lost trillions of dollars from their 401k's, IRA's and brokerage account because of them. 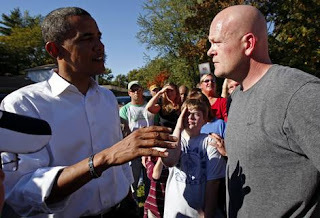 Joe Wurzelbacher of Toledo, Ohio has stirred up the political pot just 17 days before the Presidental Election, and the Obama camp and the media are boiling mad. A week ago Joe Wurzelbacher aka Joe the Plumber was not known by anybody outside of Toledo Ohio, today he is a household name. Joe the plumber has made many friends since then,but he has also made some very powerful enemies. Barack and Biden are trying to completely discredit Joe the plumber, because Barack Obama for a split second exposed himself as a wealth redistributing Socialist at Wednesday's presidential debate. I don't know exactly what the media,Obama and Biden hope to accomplish by destroying Joe the plumber. If anyone Obama and company should be upset with is Barack Obama himself. It was out of Obama's own mouth that he said "We need to redistribute the wealth". Joe the plumber didn't make him say that. He said what he felt on his own and all by himself. Obama really doesn't believe in the power of American individualism to provide for one's self. That has always been a liberal trait for the last 30 years since Lyndon Johnson's "Great Society".Think of it like this. Liberals know that if people realized that the true power rests in themselves and not government, government would cease to have a controlling influences on the society. The government has never been known to lift people out of poverty, they can only maintain a person in it. Here's an example. Liberals try to pass off social security as a "retirement fund" every chance they get yet Social Security was only meant as a supplemental account to go along with their saved up retirement. The more power the people have means the less government has, and Centralized government control is the key objective of liberals and socialism. To people that aspire to create wealth and advance, the socialist rhetoric of Obama, Biden and others like them normally falls on death ears. To the people that don't believe in their own abilities and have been told that society is keeping them down, then the class warfare dribble promoted by liberals is music to their ears. It's always easier to blame others then to blame one's self. Of course everyday someone has to pay. That means that normally there is no such thing as a free lunch and with government that is definitely true. Someone does have to pay, and it always is the taxpayer. Anyways getting back to Joe the plumber, this is him on Fox News. I have an idea who he's voting for lol. Howard Stern demostrates how absolutely stupid many Obama supporters are. Howard Stern once upon a time called himself the "King of all media". I use to listen to him growing up and for the most part he was pretty funny. Well he is still funny. This segment is funny on so many levels, and it's not because of anything special that Howard Stern says. Watch the clip and you will see what I mean. This is the Barack Obama "Harlem Quiz". Listen to the lady talking about McCain being "uneducated" then listen to her responses. I've been busy taking care of a special project. I'll be back tomorrow. From voter fraud to risky loans, McCain goes after Obama and the Acorn connection. POWERFUL!! This ad puts together the entire puzzle on Obama from A-Z. I've said a few weeks back how banks were forced to make bad loans to undeserving people, and I also just mentioned the stories of attempted voter fraud by Acorn. The Obama sheeple can try an down play the facts all they like. The truth will still be the truth. ACORN BUSTED FOR VOTER REGISTRATION FRAUD! This is the response from Acorn after they were busted in Las Vegas. The words clueless, stupid, ignornant, moronic, hapless, and dumb don't do these people any sort of justice. I guess these fools are fired up because they got caught red handed? It's pretty sad that even the comedy show Saturday Night Live knows who's truly responsible for the financial crisis. Yet the Democrats and the media continue to stick their fingers in their ears and go la la la la. The truth can only be ignored for so long. Oh yeah, NBC yanked this video off it's website once they realized how damaging it is to Democrats mainly Obama? It doesn't matter though, If the video is removed again, I've already downloaded it and will be more then happy to upload it again. The main form of defense for members of the cult of Obama is to call people who makes claims against Obama "liars" or "smear merchants". People have brought up evidence against Obama from Obama's own books,yet his faitful sheep still defend him and call the people liars still. I've presented facts on top of facts about how Democrats are to blame for the economic crisis the world now finds itself in. If Republicans were behind the fraud at Fannie and Freddie, Democrats would have been called for hearings, but there hasn't been any called. Why is that? A few years ago Democrats were squawking about "The culture of corruption" in regards to Republicans that were caught up in the Jack Abramoff scandal. Of course Democrats never mentioned the Democrats that were caught up with Abramoff as well, go figure. I posted last week the video of top Democrats including Barney Franks drilling the regulator of Fannie for actually doing his job and trying to bring to their attention the accounting scandal and finaancial shape of the institution. We all know what happened to the executives of Enron, Worldcomm, Tyco, Adelphia Communications, Rite Aid, Cendant etc. Those exec are now in prison with the exception of Kenneth Lay, he died of a heart attack prior to serving his sentence. So what about the execs of Fannie and Freddie? The members of the Obama cult can stick their heads in the dirt all they want and try to ignore the truth, the facts will still be there when they stick their heads out of the hole. I'll be more then happy to keep reminding them. McCain preparing to place the blame of the financial crisis where it truly belongs starting tomorrow night. The gang over at Restate obtained a statement today from the McCain camp stating they will be going nuclear on the Democrats that were actually responsible for the collapse of Fannie and Freddie as well as the Democrats that tried to obstruct the regulator from doing his job. McCain should have done this from day one, but better late then never. Finally it looks like he realized that kumbaya politics won't work. Obama has been enjoying a bump in the polls thanks to falsely placing the blame for the economic mess on McCain via Bush. It looks like the McCain folks finally figured out what is going on. This is just a sample of what is going to be coming out very soon. enator Obama has accused me of opposing regulation to avert this crisis. I guess he believes if a lie is big enough and repeated often enough it will be believed. But the truth is I was the one who called at the time for tighter restrictions on Fannie Mae and Freddie Mac that could have helped prevent this crisis from happening in the first place. I hope that Palin echos the same as well. Since tomorrow night's debate format favors McCain being the Townhall format, it will be very nice to see Obama on the defensive trying desperately to defend his party but also his connections to Franklin Raines. Has the Democrat Party become the party of chauvinistic, sexist "pigs"? The conservative brother speaks on the chauvinistic mindset of liberals and the Democrat Party. I had some technical difficulties with my camera, but I think everybody can clearly understand what I am saying and implying. The pitbull has finally been unleashed!! It finally looks like play time is finally over for the McCain camp. I just wish I knew why McCain was waiting so long to let her lose. Also for those who foolishly think that Obama is the only person able to attract large crowds, think again. Notice Palin doesn't have to ride the backs of rock concerts and beer festivals to attract her crowds. 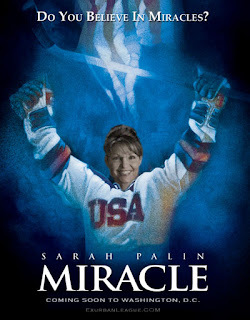 The Hockey Mom Governor beats the elitist Washington insider Senator. Ever since Governor Sarah Palin arrived on the nation scene, she has been instantly attacked by liberals in the media like no other candidate in U.S political history. Liberals attacked her daughter, her husband, hacked her email account, and tried to frame her as a clueless airhead that is nothing more then pretty to look at. From day one liberals and the media tried to dismiss her as not important, yet they can't stop obsessing on trying to destroy her. The media thought they succeeded with the sneak attacks disguised as interviews by liberal journalist activists Charles Gibson and Katie Couric. Well it's back to the drawing board for them again, because last night clearly demonstrated that they have failed to assassinate her character and give "their" impression of her. I've heard so many liberals gleefully telling me prior to the debate that Biden was going to mop the floor with Governor Palin. I just laughed knowing that they were going to be in for a rude awakening once the debate started. Thank you Governor Palin for proving me right and making liberals cringe for two hours during the debate. Speaking of Couric and Gibson, I might have actually had some respect for them if they would have asked the same questions they asked Barack Obama that they did to Palin. Even with all that has happened up to this point, Sarah Palin has fought on and clearly has demonstrated that she can debate with the best of the Washington elites, but she has clearly demonstrated that she has what it takes to connect with mainstream America and be the leader of this nation. Palin was right, the media can't filter, distort and frame what is live. Frank Luntz held a focus group real time poll among Ohio independent voters. Here's the results on how well they thought she did. Meet the "unbias" moderator for tomorrow nights VP debate. The moderator for tomorrow night's Vice Presidential debate between Governor Sarah Palin and Senator Joe Biden is Gwen Ifill. If I could, I would advise Sarah Palin to cancel the debate until a new moderator could be found. The reason I would suggest that course of action is obvious. 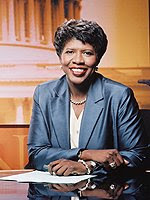 Gwen Ifill is a black liberal Democrat and more importantly she is a Barack Obama supporter. She is the managing editor for the television program "Washington Week" on PBS. The debate might as well be a wresting two on one match, with Biden and Ifill against Palin. I brought up Ifill's race for a reason. Gwen Ifill has a book scheduled to be released on the same day the next president will be sworn in on January 20th. The title of her book is entitled "The Breakthrough: Politics and Race in the Age of Obama". Conservatives are just finding out who exactly Gwen Ifill is and they are voicing their distrust of her. Think about this for a second. If Barack Obama lose the election, her book will sell as bad as Nancy Pelosi's book. If Obama wins, then Ifill's book will become a best seller. The timing of the book is a blarring sign that she believes Obama will in the election. To me anyways, this is clearly a conflict of interest. It was bad enough when Katie Couric and Charlie Gibson tired to Pearl Harbor Palin based on their ideological hatered for Palin, but Ifill is actually much worse, because she actually stands to gain financially by McCain and Palin loosing. So to say she is going to be "fair", yeah right. Now for the race angle. The content of her book is about Obama and his race in regards to politics. It only stands to reason that her as a black liberal person who is apart of the media will do everything in her power to shield Biden and go after Palin.